WASHINGTON, DC, August 10, 2011 (ENS) – President Barack Obama is scheduled to visit Holland, Michigan tomorrow to tour the Johnson Controls advanced battery facility, built with a $299 million economic stimulus grant and additional funding from the state of Michigan. Obama is using the trip to highlight the role of innovative technologies in helping automakers achieve the new fuel economy standards he has announced over the past two weeks, Heather Zichal, deputy assistant to the President for energy and climate change, told reporters on a conference call today. “Tomorrow’s trip builds on the President’s recent announcement of historic fuel-efficiency standards for cars and light trucks which will bring fuel efficiency to 54.5 miles per gallon by Model Year 2025 and which, combined with steps already taken by this administration, will save American families $1.7 trillion at the pump and reduce oil consumption by 12 billion barrels by 2025,” said Zichal. On July 29, the Obama administration and 13 automakers announced their agreement to boost the fuel economy of cars and light-duty trucks sold in the United States to 54.5 miles per gallon by 2025. On August 9, President Obama announced the first national fuel efficiency and greenhouse gas emissions standards for work trucks, buses and other heavy-duty vehicles made between 2014 and 2018. In May 2009, the Obama administration raised fuel efficiency of vehicles made in model years 2012-2016 to 35.5 mpg. Drivers will begin to save money at the pump this year when the model year 2012 vehicles debut in the fall. “Achieving these standards will encourage automakers to use the advanced technologies like the batteries Johnson Controls is making,” Zichal said. President Obama will use his visit to the Johnson Controls facility to demonstrate how his $787 billion economic stimulus under the American Recovery and Reinvestment Act has rejuvenated the economy, especially the auto industry, which was especially hard-hit by the recession. In 2009, Johnson Controls received a $299.2 million grant to build a domestic manufacturing capacity for advanced batteries for electric drive and hybrid vehicles – the largest grant awarded by the U.S. Department of Energy under the American Recovery and Reinvestment Act, ARRA. Also in 2009, the company’s joint venture Johnson Controls-Saft received incentives adding up to $168.5 million from the State of Michigan to build the Holland battery plant, using an existing Johnson Controls facility. 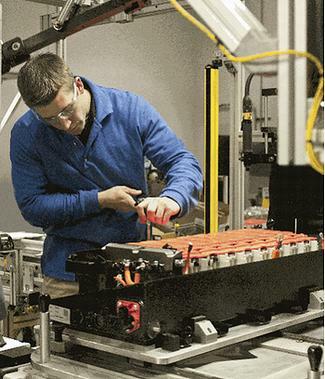 Johnson Controls is a long-time supplier of lead acid batteries for cars, light trucks and utility vehicles and launched the world’s first automotive lithium-ion cell manufacturing and battery assembly facility in Nersac, France in 2008. About 150 people are employed at the new factory in Holland, which makes lithium-ion battery cells and complete hybrid battery systems. These batteries enable engine stop-and-start capability, in which car and truck engines shut down at idle to save fuel. The plant was launched and shipping hybrid batteries 10 months after receiving the federal ARRA grant. More than 155,000 American workers already are making components for clean, fuel-efficient vehicles, and that number could jump as U.S. drivers buy the next generations of fuel efficient cars and trucks, new research shows. The report, jointly produced by the Natural Resources Defense Council, the National Wildlife Federation and the United Auto Workers union, comes in advance of the President’s planned visit to Johnson Controls and links fuel-efficient vehicles with economic vitality. According to the report, 43 states and the District of Columbia now host the 300-plus manufacturers that develop and supply key components for advanced internal combustion engines and vehicles, hybrid power-trains and plug-in electric vehicles. The report, “Supplying Ingenuity: U.S. Suppliers of Clean, Fuel-Efficient Vehicle Technologies,” lists the top 15 states employing the highest number of autoworkers in clean, efficient technologies: Michigan, Ohio, Indiana, North Carolina, Kentucky, Pennsylvania, Texas, Alabama, California, South Carolina, Tennessee, New York, Illinois, Virginia, and Arizona. “This report demonstrates how strong fuel efficiency standards for cars and trucks sustain local jobs. They also safeguard wildlife, and protect America’s public health,” said Jim Lyon, the National Wildlife Federation’s senior vice president for conservation programs. “It’s critical that Congress stops putting these gains at risk by grandstanding against the Clean Air Act and other landmark laws that Americans across the nation rely on,” Lyon said. Click here for a copy of the report, including an interactive map.